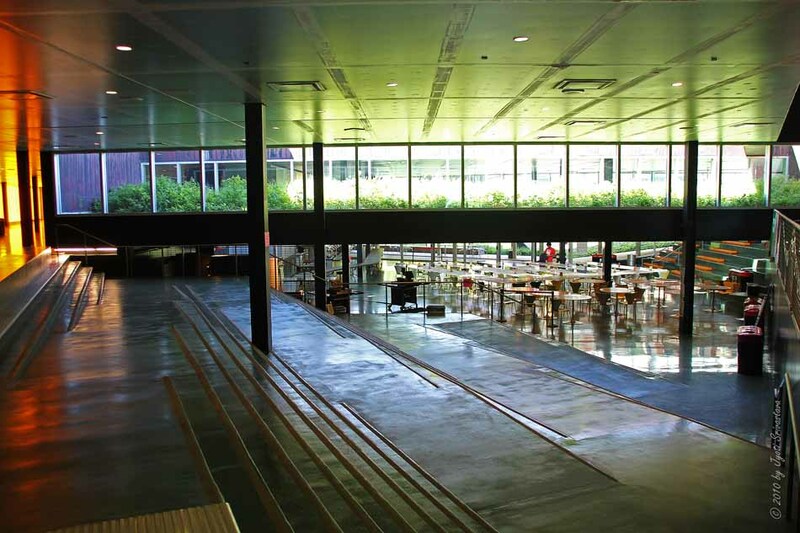 Chicago - Architecture & Cityscape: IIT Campus: The McCormick Tribune Campus Center..
IIT Campus: The McCormick Tribune Campus Center.. The Exelon Tube.. A concrete tube, clad in corrugated stainless steel, that wraps the CTA elevated railroad ["L"] tracks to dampen the train noise.. 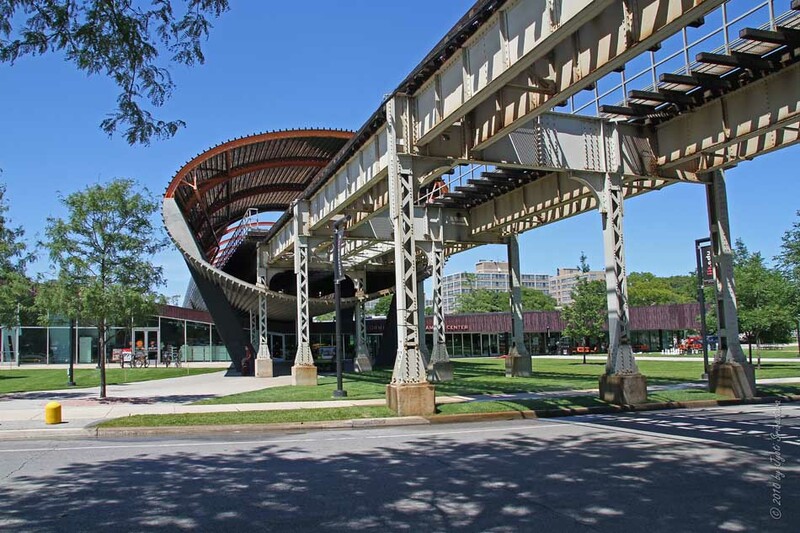 The concrete and stainless steel tube encloses a 530-foot stretch of the L tracks... and it really dampens the sound of the trains over-head as students enjoy various campus activities below. 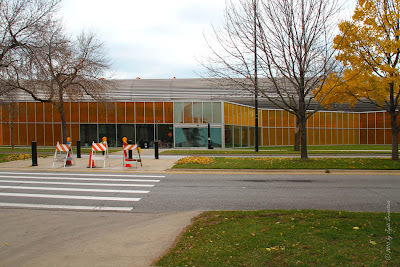 And beneath this Exelon Tube is the Campus Center. 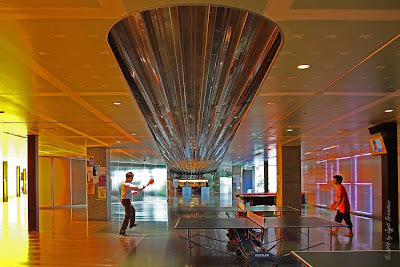 Students playing in the Campus Center, as a Green Line train passes right above them, through the Exelon Tube.. 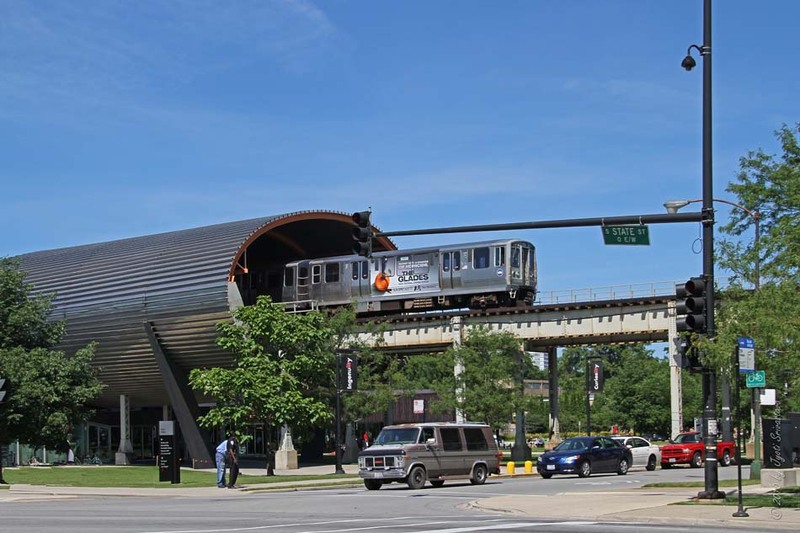 The Exelon Tube and The McCormick Tribune Campus Center.. Location: 33rd and State Streets, on Chicago's south side. 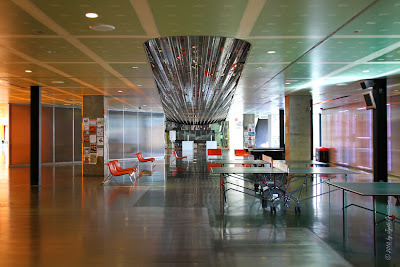 Designed by Pritzker Prize winning architect Rem Koolhaas, of the Office for Metropolitan Architecture [OMA], Rotterdam.. 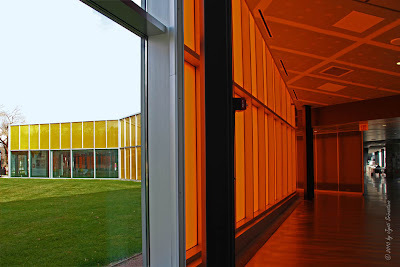 This is Koolhaas' first completed building in the United States..
As one enters the building, this is the view. 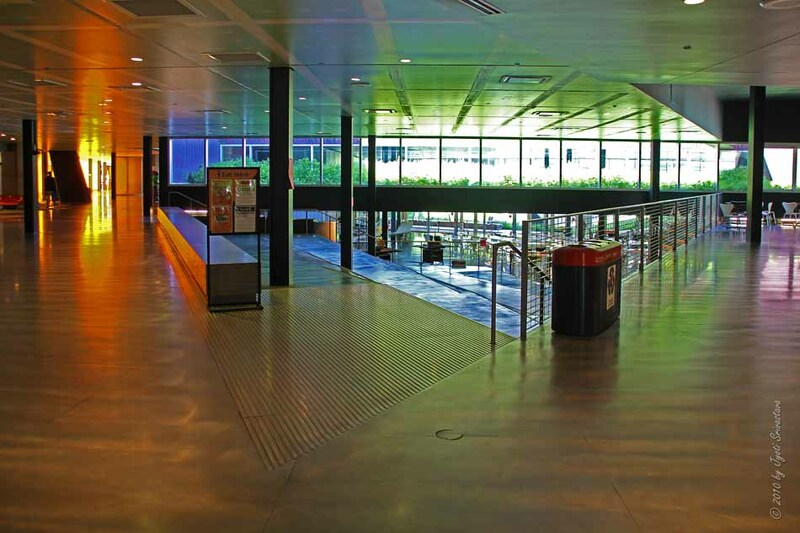 Orange hues on the west side and green in the center..
As we enter, we see these steps and space.. 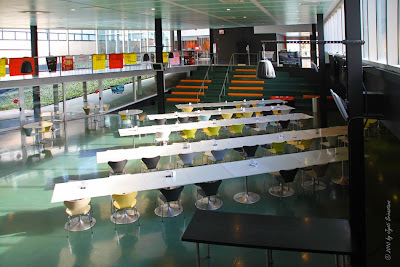 This terrain is for student gathering. 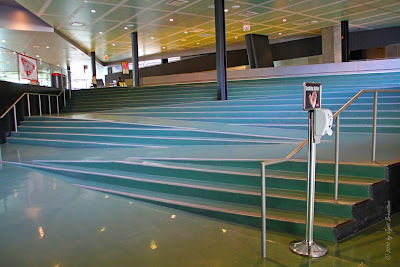 Notice the steps skillfull of steps and handicapped ramp at the same time. 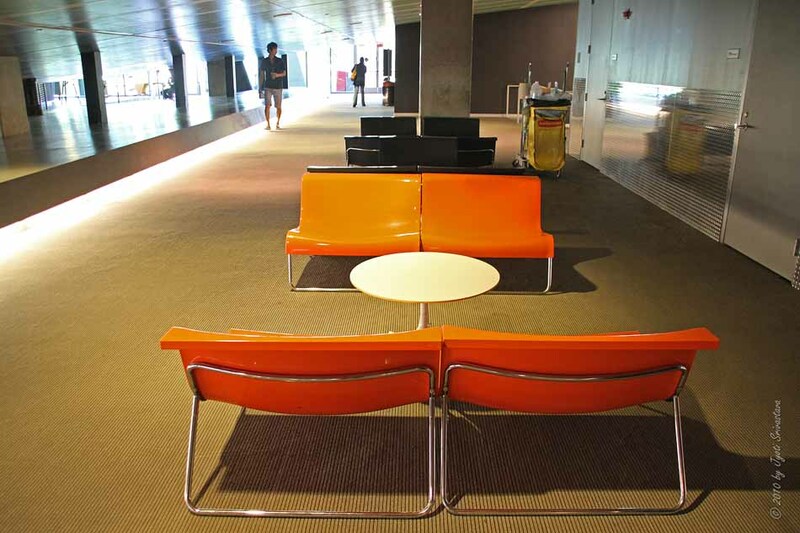 Apart for providing space for gathering, it leads to the center-court. 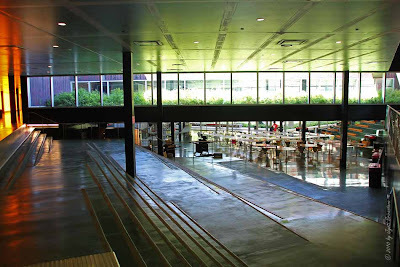 The ramp leads to a sunken two-story center court, with recreational and dining area.. This might have been a dingy basement.. 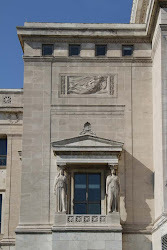 Note the hanging garden lies above the center-court. It brings light and nature to the heart of the building. 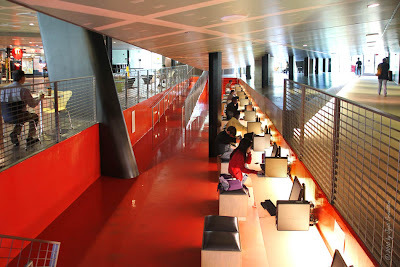 A sunken area, with a continuous band of computer stations.. The 93-foot-long shelf is painted a bright red. 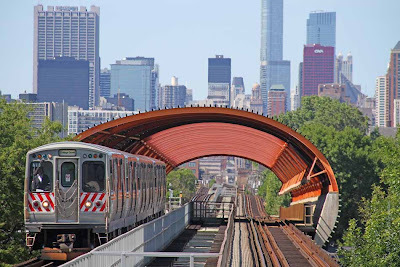 A continuous orange wall on the west side of the building, that brightens the entire interior..And I love the color orange..
Just beneath the railway tracks, covered in the Exelon Tube.. 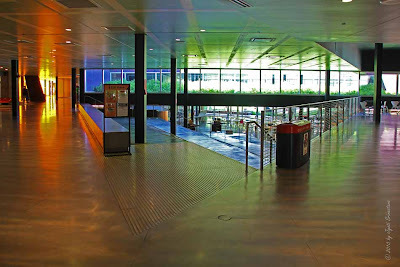 The main federating element is the roof, a continuous concrete slab that shields the centre from the noise of the elevated railway while unifying the heterogeneity below. 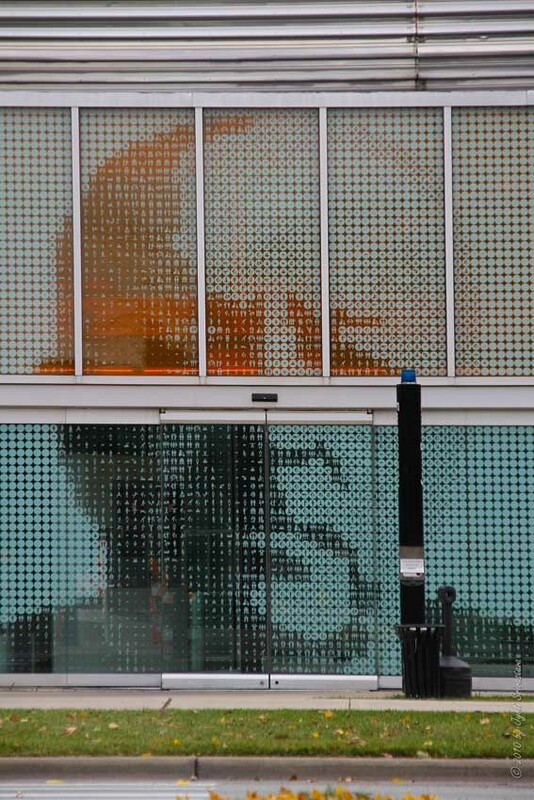 Glass portrait of Mies van der Rohe..
On the northwest side of the building, visitors enter through a 20-foot image of Mies’s face.. 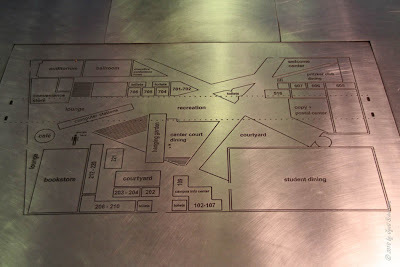 The master plan of the IIT campus, wasdesigned by Mies in 1941. 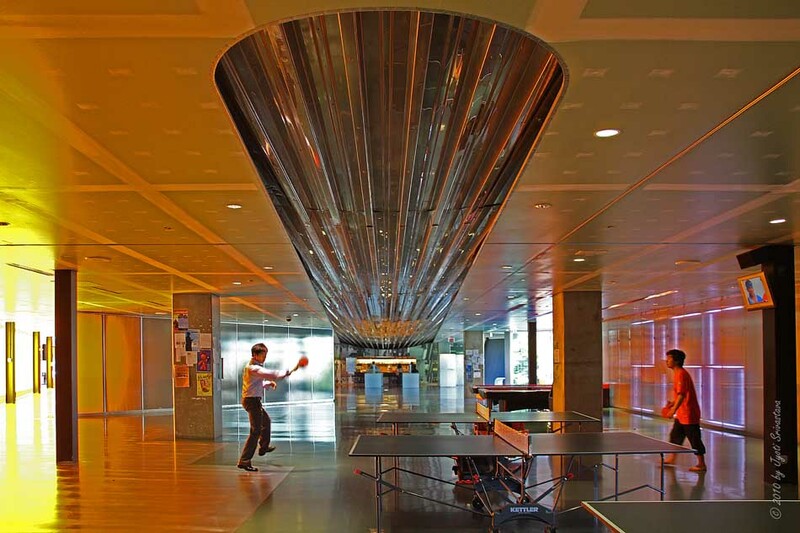 It is one of the largest projects he conceived. 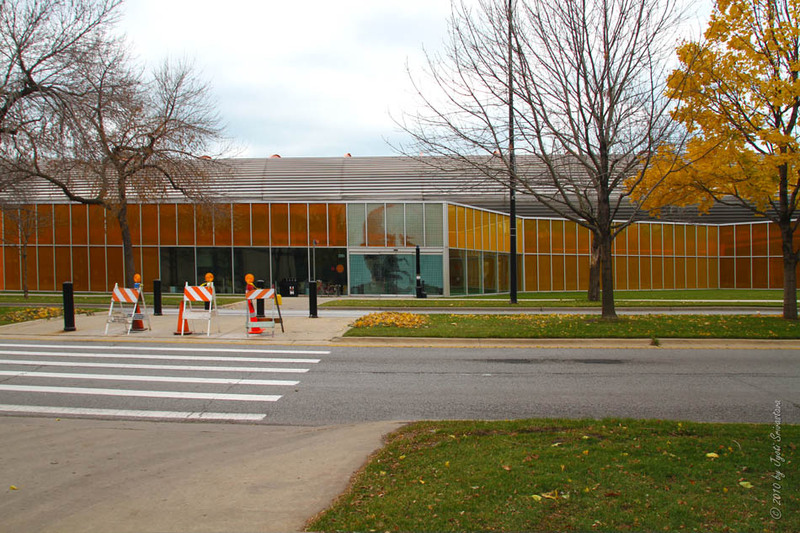 The campus encompasses 20 of his buildings, the greatest concentration of Mies-designed buildings in the world. 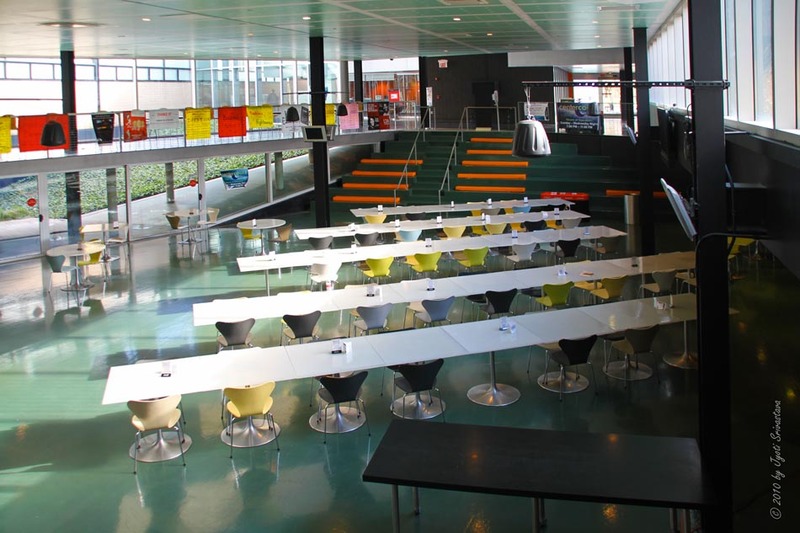 This is indeed a wonderful place for students to gather and spend time together. I enjoy going in the center myself and having a cup of hot chocolate. I'm told that the use of orange is a because Koolhas and OMA are Dutch. @ Terry - I love that place! @ Rick - That's a very interesting piece of information.. I like this idea of people coming from different nationalities and leaving a trace of their national identities on their work..
And I anyways love orange color!! I'm a student in architecture in Paris. I'm writing you to ask you some questions. 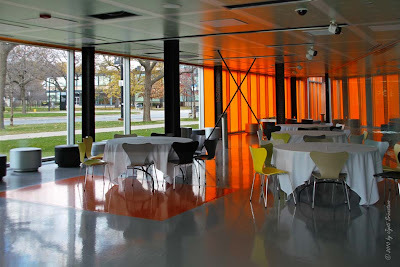 I've to study the McCormick Tribune Campus Center (by OMA) in the Illinois Institute of Technology, Chicago. As you are a student (/you have study) there, can I ask you some quick questions about it please? -How is the attendance (traffic?) of person in the building? -How much? 200? 500? 1000? 2000? -What for? computer lab? 7-Eleven? bookstore? study? lounge? game? meditation? mail room? -Who are coming? students? teachers? tourists? other? -Where do they come? the campus? Chicago downtown? uptown? 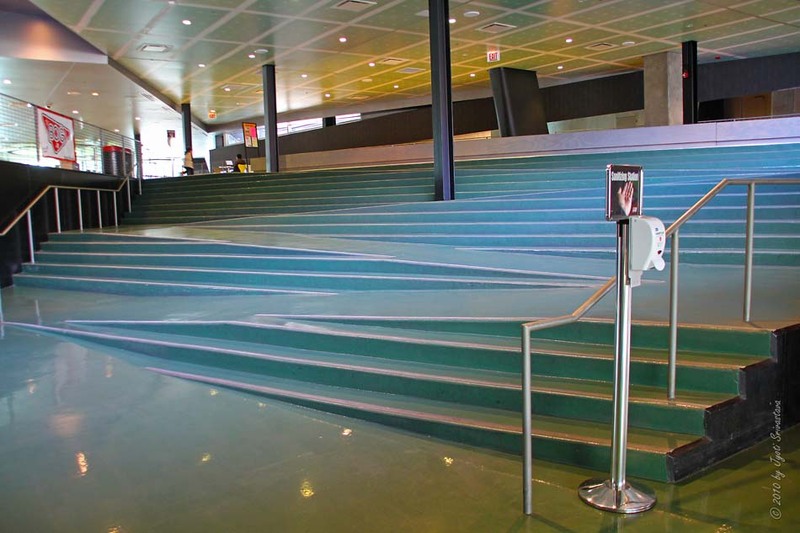 Is there an entrance more used by the users? 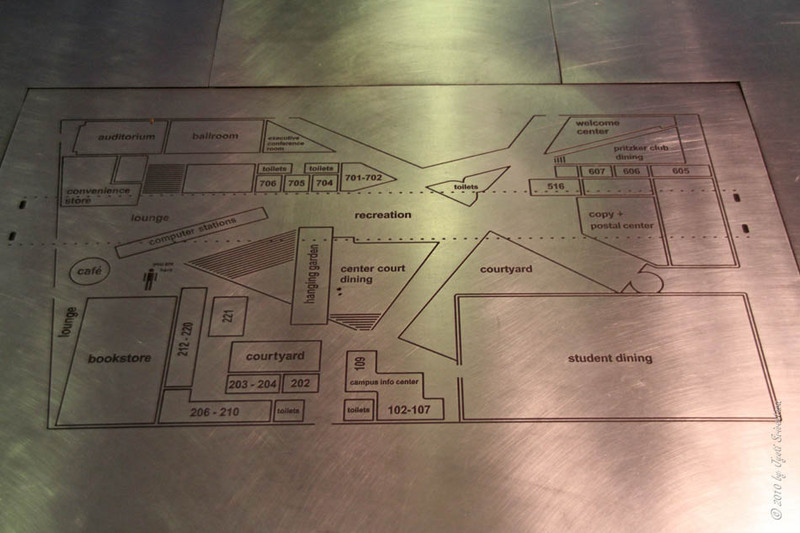 Where is the "animated center" of the campus? Do you like the McCormick Tribune Campus Center? Why? Why not? This will be very helpful to me. Thank you very much in advance for the answers you will be able to give me. I will be grateful for those.